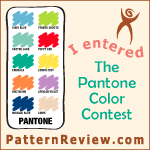 Retro Sewing Romance Writer: Where Did Summer Go? You know how the previous post was called Long Days of Summer? Well, this one should be called Did Anyone Notice Summer Go By? Talk about a blur--but it was a good blur. I did get my apricot maxi skirt done, along with a few T-shirts, but my coup d'grace this summer was Vogue 4617. 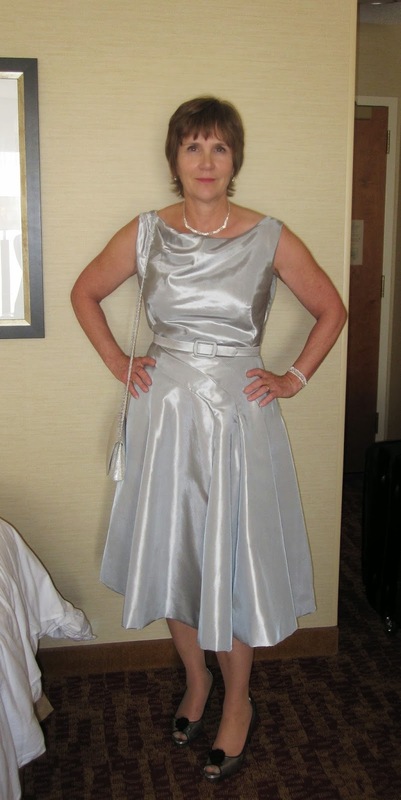 I made the sleeveless version out of pale gray taffeta. It actually turned out to be silver. I was going to make the dress last summer, but came up against an obstacle when the pattern called for "skirt stiffening". I had no idea what that was and none of my books or internet searches answered the question. Happily, this past spring I happened across a vintage 1950s dress in a thrift store and noticed that the entire skirt was lined in nonwoven interfacing. Skirt stiffening was simply interfacing! You can see the cracks in the nonwoven interfacing. The nonwoven interfacing hadn't aged all that well, but it still made a huge difference in the drape of the skirt, so I knew that (a) the "optional" skirt stiffening was necessary and (b) I had to find some 60 inch wide nonwoven interfacing. I eventually found some gorgeous interfacing at Fashion Sewing Supply. I believe the interfacing cost more than the fashion fabric, but it was totally necessary. I'll be "stiffening" more 50s skirts in the future. I hand basted the interfacing to each skirt piece, just like underlining, but I didn't baste across the bottom hem area. I've had trouble with bubbling between the interlining and fashion fabric and leaving the bottom open helps me deal with this. All in all the construction was straight forward, right up until I had to attach the bodice to the skirt. My waist is very high, so I normally shorten the bodice a good inch. This time I did it differently. I put the unshortened bodice on Tillie, then I turned under 5/8 inch on the top of the skirt. I put the skirt on Tillie, situating it exactly at the waistline, then marked the position. After that I removed the bodice and skirt, then pinned the skirt to the marked line and trimmed the bodice to match the skirt. 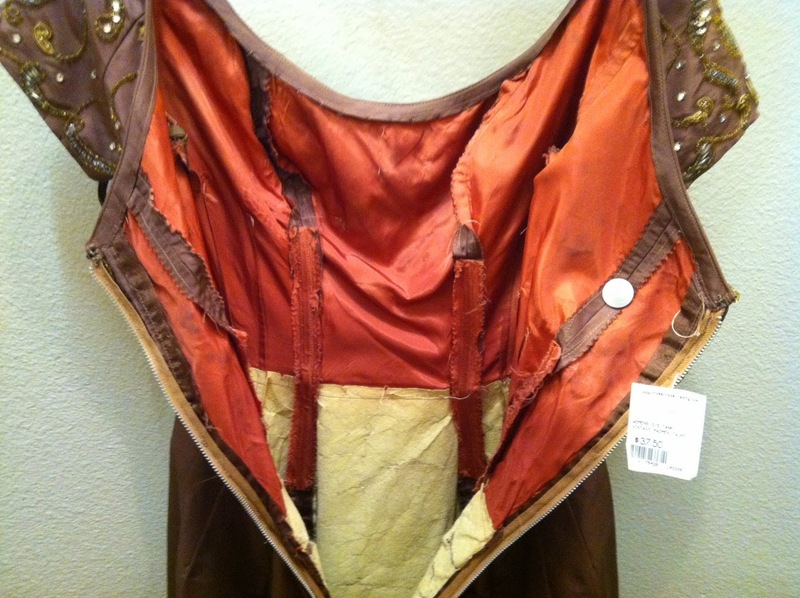 The bodice has one pleated shoulder and one plain. There are a few tacks to hold the pleats in place. I hand picked the zipper. I've never done this before and now it's my favorite way to put in a zipper. I love the look and love how precise it is. 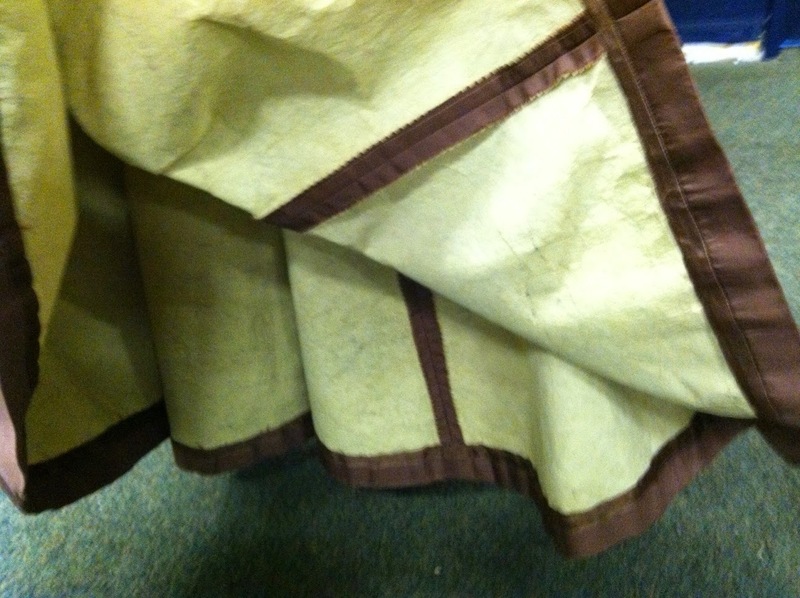 Here are some shots of the skirt panel detail. I stay stitched to make certain they didn't stretch on the bias and to make sure the waist didn't stretch. To hem the dress, since the stiffening wasn't basted to the skirt at the bottom, I marked the hem and hand basted along the hemline through both the stiffening and the taffeta. Then I trimmed the hem to 2 inches, sewed on lace and turned it up along the basting. I tacked the hem to the stiffening, so it didn't show on the outside. 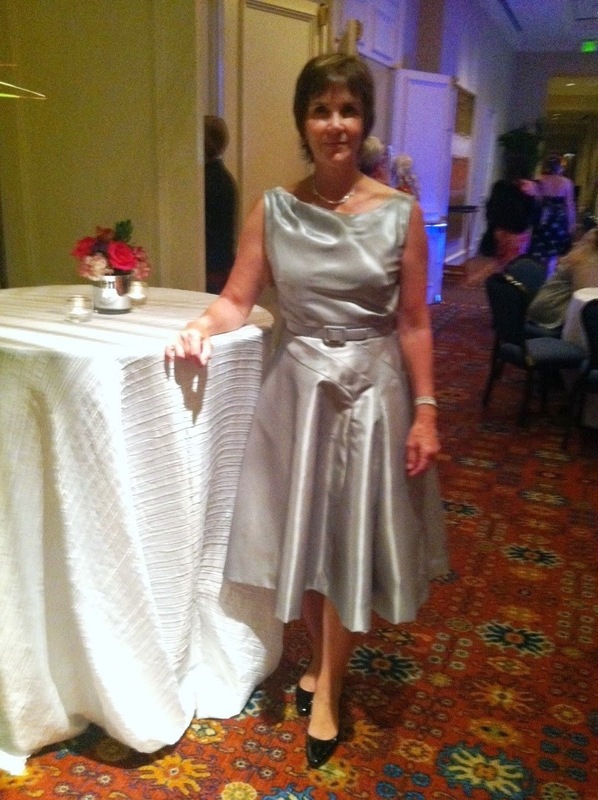 I wore the dress to the Harlequin party at the Romance Writers of America National conference. It was super comfortable and the stiffened skirt was a lot of fun to wear. No crinoline necessary, so no itchy legs. Yay! I made a self-fabric belt out of a vintage kit. I was afraid that 1 inch belt would be too thick, but now I think it's perfect for this dress. That is just beautiful! Thank you for all the sewing details too. Just found your blog after doing a search for vintage sewing blogs. You are just what I was looking for for inspiration! Thank you! 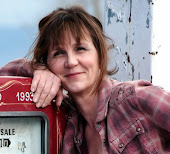 I hope you find some useful information in the blog. Oh! Well done! I think stiffening is a wonderful alternative to a crinoline. The stiffening made the skirt amazing. It was so much fun to wear! I'm a convert now that I've discovered a source of wide interfacing.